Given the prominence (dominance?) 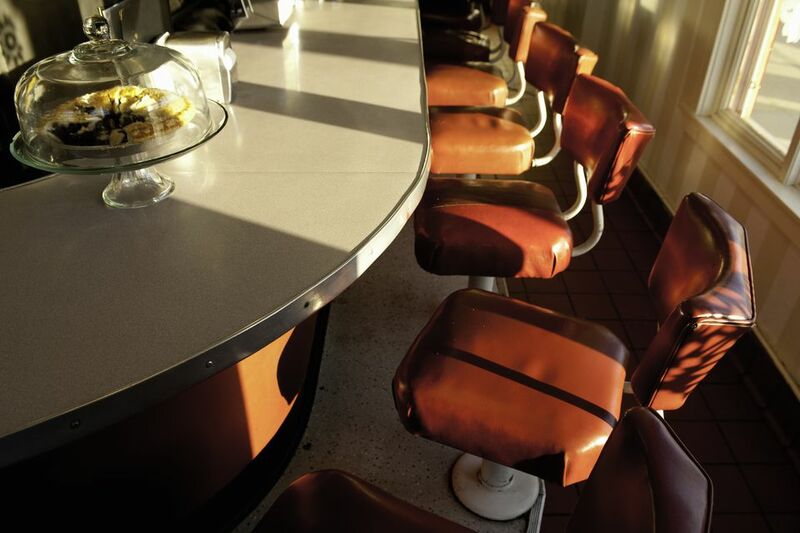 of the automobile in San Diego, the lack of classic roadside diners is somewhat surprising. You know the kind: stainless steel prefab structures that resemble railroad dining cars (hence the name "diner"). It's easy to love diner food: unpretentious comfort food, breakfast at any time of the day, and a counter to eat at (ya gotta have a counter!). That being said, San Diego does have a few genuine diner-style restaurants worth their meatloaf. A genuine San Diego institution, Chicken Pie Shop in North Park has been serving cheap, tasty comfort food forever. I think some servers and customers have been here forever. Why? Because of those chicken pies (actually turkey), crusty, meaty delectable pies smothered in gravy. Yum. And service is fast. OK, now we're talking genuine diner: all steel and chrome and bay windows. Studio Diner is a true roadside diner, located off the beaten path on the grounds of the Stu Segall studios (Veronica Mars). Refurbished with a movie studio theme, Studio Diner is sleek and slightly upscale, featuring comfort food tweaked ever so slightly, in a delicious way. The pot roast and meatloaf are can't miss. Plus, it's open 24 hours. If Rudford's had chrome instead of stucco, it would be a genuine diner, because it has the bay windows and mid-century signage. In any case, it's a landmark (and just down the street from the Chicken Pie Shop). Basic comfort fare here, which gets mixed reviews. But if you have a hankering for a burger or breakfast at 3 a.m., you go here because it's open 24 hours. Located just beyond Old Town, near the I-5/8 interchange, Perry's Cafe is a trucker's type of diner with a devoted clientele. They swear the pancakes - along with the other hearty fare - at Perry's are the reason you keep coming back. Do you want a genuine Jewish deli? Look no further than D.Z. Akin's in La Mesa. It's not exactly a diner per se, but it might as well be. Just off I-8 and 70th Street, this is the real deal for kosher sandwiches, meals, breakfast, baked goods - you name it. If you think the sandwiches are huge, just look at the menu! Want a knish? A black and white cookie? Real corned beef on rye? The best matzo ball soup and potato salad this side of Manhattan? This cozy cafe in the heart of Hillcrest is a local favorite and one of the city's best-kept secrets. The food is delicious, the service friendly, the portions fine - comfort food at its best. Parking is tough, but find a spot a few blocks away and stroll the neighborhood. It's worth it. Brothers Family Restaurant, located in decidedly middle-class Allied Gardens, is the type of diner that every neighborhood should be required to have. It's a place that serves up straightforward comfort food - nothing fancy, just good, homestyle stuff. There's nothing fancy about it - people just love it, from seniors to families, everyone is happy. It's not open very late (dinner is served on selected days), but if you're in the neighborhood definitely check it out. Where Is the Best Place to See a Concert in San Diego?